﻿ Member of European Parliament Impressed by Shen Yun: "I Just Don't Know How They Manage To Do It." Member of European Parliament Impressed by Shen Yun: "I Just Don't Know How They Manage To Do It." Shen Yun Performing Arts Touring Company concluded a spectacular, ten-show run, at the Aula Magna in Louvain-La-Neuve, Belgium on May 11, 2010. 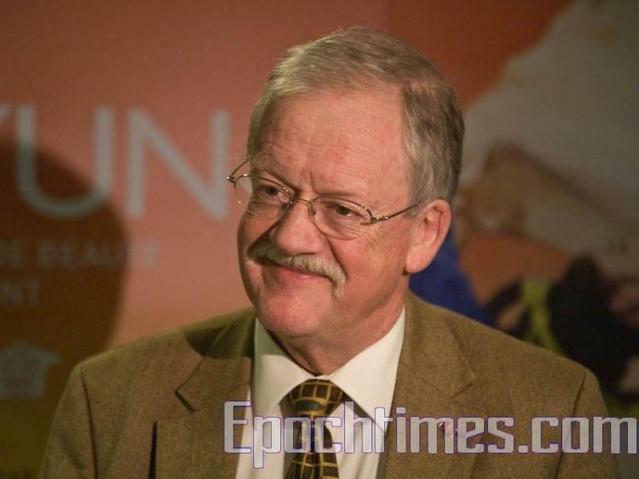 Roger Helmer, a member of the European Parliament representing East Midlands, UK. Among the many distinguished guests at the show was European Parliament member, Roger Helmer, who represents East Midlands, UK. During intermission, Mr. Helmer remarked about the performer's athletic skills and ability, saying, "I just don't know how they manage to do it." Regarding the use of animated backdrops in the show, the MEP said, "The backdrops were very impressive," adding, "It's the action and the movement, and the music that really makes the show. It's wonderful." Mr. Helmer said he would definitely recommend the show to his friends. Retired banker says Shen Yun is "Very captivating"
Mr. Kayaerts, a retired banker, and Ms. Naelten, a professor. Mr. Kayaerts, a retired banker attended the show with Ms. Naelten, a university professor. "We liked it very much," said Mr. Kayaerts, "I think all the dance sets are wonderful, with the music, very, very captivating." Ms. Naelten agreed, saying, "Fantastic!" "Everything is beautiful. Very nice, very nice things. I think that it gives you an image of another culture, of other traditions." She thought that the overall show was "presented very, very well," adding, "Artistically, it's more than magnificent. It gives you an impression of everything with the different pieces. It gives an impression of the difficulty of the acceptance of the opinion of everyone." Continuing she said, "I think the show is very picturesque. It's really the reality. It is not only very close to the reality, but it is the reality over there in China. "But I think it's a good thing to go into detail on this, to show a bit about the Tibetan culture, and other cultures in this way, in these picturesque pieces. I think it's a wonderful and a very beautiful idea. She was very moved by the overall presentation of the show, saying, "The costumes are wonderful. The landscape, the way everything is presented." Mr. Kayaerts and Ms. Naelten said that they will both recommend the show to their friends. Ms. Naelten said she'll tell her friends about Shen Yun by "telling them about the beauty of the dances, of the choreography, and of the costumes," without telling them too much, so that they'll "have that pleasure to see it as well." "I would tell a bit to raise their interest but not too much, so that that there will remain much for them to discover," she said. She concluded by saying, "When this group comes again, I'm certainly going to come with other people to see this show again." Also attending the show were Mr. and Mrs. Brouillère. "I liked everything very much; everything," said Mr. Brouillère, a retired consultant, after watching the show. Ms. Brouillère, also retired, thought the show was "splendid, wonderful ... the colours, everything. Bravo!" 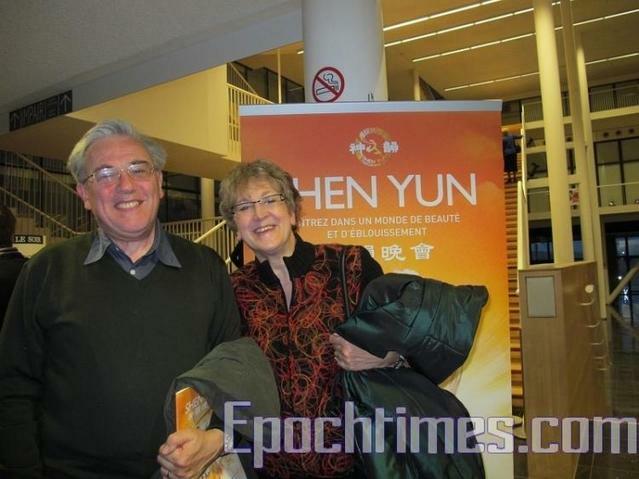 Belgian Audiences Continue to Have High Praise for Shen Yun Performing Arts: "It Was Very Touching!" Journalist: "Wonderful, perfect, very exotic"
New Zealand: Choreographer Speaks of Shen Yun: "They Made It Look Very, Very Easy"